Joshua M. Rosenblum, MD accepted his 2017 Hawley Seiler Residents Award at the November 2017 STSA Annual Meeting in San Antonio. 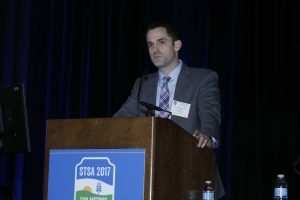 Residents are invited to submit abstracts for the STSA 65th Annual Meeting and participate in the 2018 Hawley Seiler Residents Award Competition. The 2018 Hawley Seiler Residents Award recipient will receive $500, a personalized plaque, and their name will be engraved on a permanent plaque to be displayed at future STSA Annual Meetings. The recipient will be announced at the 2018 Annual Awards Dinner & Dance. Residents participating in the competition are eligible for reduced-price tickets to attend this event. Review the STSA 65th Annual Meeting Abstract and Surgical Video Submission Guidelines. Access the STSA 65th Annual Meeting abstract submission site. To enter the competition, accept the decision to participate in the awards program in Step 3. The deadline to submit abstracts is April 6, 2018, 11:59 pm, ET. For technical questions regarding submissions, e-mail Technical Support at ts.acsupport@thomson.com or call (434) 964-4100. Technical Support is available Monday-Friday from 8:30 a.m. to 8:30 p.m., ET. For non-technical questions regarding submissions, e-mail STSA at stsa@stsa.org or call (312) 202-5892.